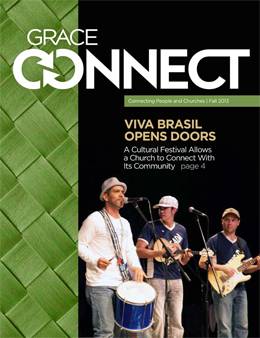 The Fall 2013 issue of GraceConnect magazine should be arriving in the homes of subscribers this week. The publication, produced by the Brethren Missionary Herald Company for leaders and individuals in the Fellowship of Grace Brethren Churches, is printed quarterly and sent, at no charge, to interested individuals. Viva Brasil Opens Doors, a story about how Grace Community Church, Mississauga, Ontario (Bartley Sawatsky, pastor), used a local cultural festival to reach into its community. Cultural Encounter, which details how Grace College students choose to spend their spring breaks completing short-term mission trips around the globe. Terry White: Renaissance Man, a feature about Terry White, former executive director of the Brethren Missionary Herald Company, who is credited for sparking life back into the organization. Regroup, Rejuvenate, and Roll, a recap of the activities at the 2013 national conference of the Fellowship of Grace Brethren Churches — Vision2020South. Action into Words, a report of the annual Grace Brethren youth conference, Momentum, which was held in July in Marion, Ind. A digital copy of the magazine (PDF file) may be downloaded here. Stories from the magazine will be posted to this site over the next few weeks.